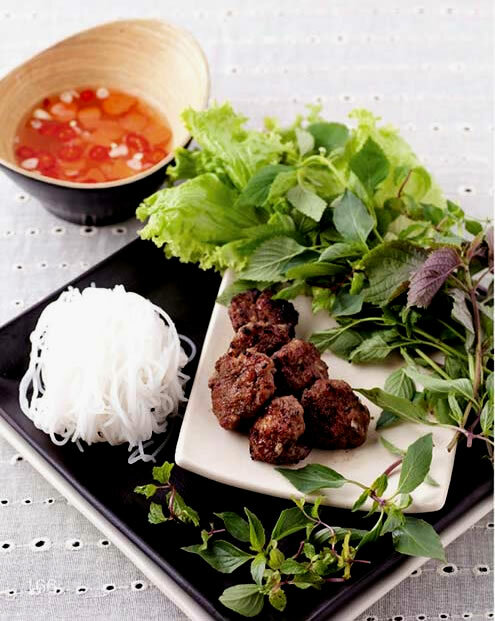 This is one of the most popular dishes from the North of Vietnam where meat was more readily available. The texture of the grilled meat with the cold noodles and fresh herbs give it a light and healthy quality. Mix pork, salt, pepper, sugar, shallots, spring onions and garlic in a bowl. Roll into small meatballs, flatten slightly. Char grill or pan fry for 4 minutes on each side. Serve on 4 plates with cold noodles, mixed herbs and sweet and sour sauce.